Get Cell 411 | The social network for helpful people. With cell and alert-based chat! Cell 411 can alert your friends, neighbors, and even emergency service providers when you are in danger, experiencing medical distress, or just need assistance. Join, organize, and manage Cells of users all on your own, allowing you full control over what services and groups you want to have contact with. You can alert your friends when you need help or receive alerts when they need help, with directions to where you should go. Only people you specifically issue alerts to can see them. Police brutality, illegal searches and other government abuses can be broadcast out to your local cell with turn-by-turn directions to your location. How do I issue a Cell 411 alert? When you open Cell 411, you will see the Cell 411 icon or your profile icon displayed at your current location on the map. Tap on the icon to open the alerts menu and choose the alert you wish to issue. You will be prompted to choose the Cell or group of users to alert, and they will all be notified immediately, along with the time and your location. Users receiving the alert will be prompted to inform they intend to assist you, or to let you know that they are presently unable to help. 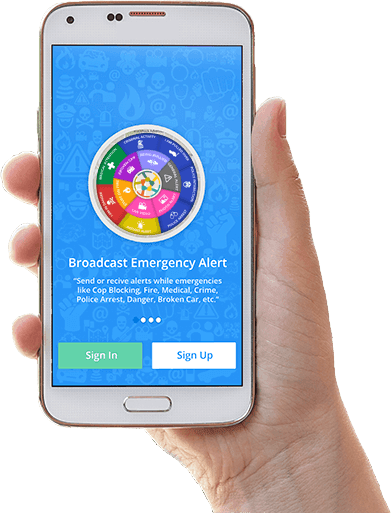 After you issue an alert, Cell 411 will also prompt you to start streaming live video to the group you alerted, allowing them to watch the live video stream from your device. I can't add my friends because they don't have accounts, so now what? You cannot add someone as a Cell 411 contact unless they also use the app and have created an account on the Cell 411 network. If you cannot find your friends using the e-mail address they used to register, you can send them an invitation to signup. They will receive an e-mail message from you so they can also start using the app and benefit from it. You can send someone an invitation either by adding them as a friend or tapping on the Friends icon at the bottom of the screen. Cell 411 uses Gravatar.com to assign custom icons to our users. If you have a Gravatar account under the same e-mail address you used when you signed up for Cell 411, the app will automatically use your default Gravatar. If you don’t use Gravatar, the app will simply use the standard logo to illustrate your presence on the map. How do I pull up the "Know Your Rights" screen? If you are in an encounter with the police and need a quick reminder about what your constitutional rights are, tap on the menu icon located in the upper left corner of the screen then tap on “Know your rights.” It will bring up a small flyer with 5 bullet points and advice on what you should do during a police encounter. Why does Cell 411 ask for my phone number and emergency contact information? When you issue Cell 411 alerts, the people receiving your alerts will be prompted to call you or call your emergency contact in case of an emergency. This information is for that purpose only and you are not required to enter it into your account settings. Just keep in mind that others will have no other means to contact you if these fields are left blank. Dispatch Mode is a feature in Cell 411 which allows you to dispatch alerts to your groups of friends and choose a custom location for the alert. Do NOT enable Dispatch Mode unless you or volunteer as a dispatcher for your neighborhood watch group or another organization or group of Cell 411 users! The feature is disabled by default and must be manually enabled in the Settings screen. Once enabled, you can operate as a dispatcher for alerts. Rather than sending out an alert from your current location, Dispatch Mode will ask you to drop a pin on the map to the location where the event or emergency is taking place. Once you choose the exact location and send out an alert, your friends will be directed to the location you picked. This feature can be used to de-centralize the management of emergencies and alerts, and it can be extremely useful for small communities, volunteer fire fighter departments, small villages or other organizations that lack the funding necessary to hire a full-time dispatcher to take calls or handle the routing of calls. The feature should be disabled once used, unless you want to operate as a full-time dispatcher for your groups of friends, neighbors, or community. Why does Cell 411 require so many device permissions? Identity: Cell 411 needs to be able to make calls to the Google Maps API in order to load map data. This requires the Identity permission. Contacts: Cell 411 needs to be able to load your contacts and allow you to add them as friends. Location: Cell 411 needs to be able to determine your geographic location, either through network triangulation or by using GPS, in order to relay your location to selected contacts when you issue an alert. Phone: Cell 411 needs to be able to make phone calls to your contacts when they issue alerts. Photos / Media / Files: Cell 411 needs to be able to read and write to and from the file system in order to cache certain data, such as user icons and images. Camera: Cell 411 needs to be able to use your camera in order to stream and record live video when you issue an alert. Microphone: Cell 411 needs to able to use your microphone in order for sound to be included along with live streaming video. Can I be held legally liable if I help someone? Cell 411 is an app that puts the responsibility of your choices on you, the user, which is why we recommend you use caution when rendering help to others or seeking out help from others — especially when using Patrol Mode or issuing Global Alerts. Virtually every state in the United States has so-called “Good Samaritan Laws,” which offer civil and criminal protection for those offering medical and emergency aid in good faith. For users in other countries, we recommend that you research your local laws, and act accordingly with caution. What data do you store and share with others? We only store data about our users which is absolutely critical to the functions of our apps and platform. We store the following information: the name, e-mail address and other information you enter when creating a new account. We also store your GPS coordinates when you issue an emergency alert. We do not track our users in real-time. We do not share any data with ANY third parties for any reason. We do share the coordinates, type and details of an emergency alert with your Cell 411 friends when you issue that emergency alert so your friends can respond when you need help. Can the government track me through your app? No. Cell 411 does not communicate any GPS coordinates to our servers until you issue an alert. Only when you issue an alert, your current GPS coordinates are temporarily stored in a database in order to be communicated to your friends. As long as you do not issue an alert, your coordinates are not communicated to any our servers. Furthermore, we do not give access to any outside entities to our servers, and we de-identify the data after a period of time, only storing the alert type and coordinates of the alert for reporting purposes. No names, numbers, or any other identifying data are stored long-term on our servers. How do I block a user that is sending too many alerts? To mark someone as a ‘spammer’ go into the Settings -> Alerts tab and then tap on one of the alerts they issued. You will be prompted to mark him or her as a spammer, which means that you will no longer receive any alerts from them in the future. How do I use and manage my cells? Tap on the Cells icon located at the bottom of the screen; you will be able to swipe left and right to view your Private and Public cells. If you want to create a new private cell, you can tap on the + icon located in the bottom right corner of the Private Cells screen. Once you tap on the Add Cell option, you can give your new cell a name (e.g., “My Family”) and then tap on the friends you wish to add to the Cell. Later on, you can choose the cell to alert when issuing alerts. To delete a private cell, tap and hold on the cell name. If you want to create a new Public Cell, you can tap on the green icon in the My Public Cells screen. Once you create a public cell, all users in your area will be automatically notified that a new cell was created, so you may receive join requests from strangers. Be aware that if you allow others to join your public cells, they will be able to send and receive alerts to and from that cell and all its members. Note: once you create a public cell, you CANNOT rename it in order to avoid bait-and-switch cell creation activity, so please make sure you name your public cells appropriately from the beginning. To delete a public cell, tap and hold on the cell name. To join public cells in your area, you can swipe right in the Cells screen and all the public cells in your geographic area will be listed. You can use the slider bar to increase or decrease the distance radius for listing public cells. To leave a public cell you joined, tap on the Leave icon located next to the cell. How to I re-center the map if I am in motion or my icon is no longer visible? To re-center the map to your current location, you can tap the small map pin icon located in the lower right side of the screen. How do I bring back a missed alert? To review older alerts, go to the Settings -> Alerts tab and tap on the alert you want to review. Unfortunately missed alerts will not offer you turn-by-turn directions to a friend’s location as the alert or location may contain stale or outdated information. 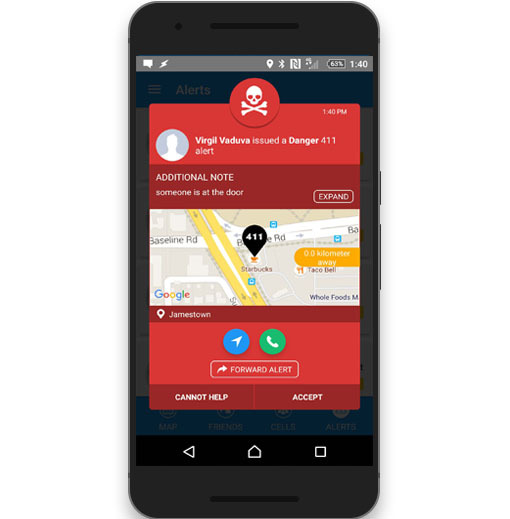 Patrol Mode is a feature in Cell 411 which allows you to receive and respond to alerts from users that are not in your contacts. When users decide to issue a “Global” alert, everyone within a 50 mile radius who has Patrol Mode enabled will receive the alert and be able to respond to it. This could be very useful in situations of natural disasters or should you find yourself stranded away from your home area without any friends being able to come and help you in a timely manner. You can enable Patrol Mode in the Settings -> Options tab, or by tapping the green icon on the main menu screen on the map. You can also adjust the radius for which you want Patrol Mode to function. How do I start streaming video? To start streaming live video, tap on the “Live Video” menu option with the camera icon on the main map screen in Cell 411. You will be prompted to choose the group to stream to. Make sure you orient your phone in landscape mode to avoid creating a video that is recorded sideways. You can also tap on “Stream Video” option that will be presented to you when you issue an alert. Both methods will start a live video stream to the members of the cell you chose to stream to. In addition to this, you can also stream live video to your own YouTube Live Channel and also to the Cell 411 TV channels on Facebook and YouTube. You can enable these settings by tapping going to the Settings screen then tapping on Video Settings option locate at the top of the Settings screen. How do I erase a video I streamed? You cannot erase a previously streamed video through the Cell 411 interface. This is in order to protect your footage from a malicious users who may have stolen your phone in an effort to erase evidence of wrongdoing. 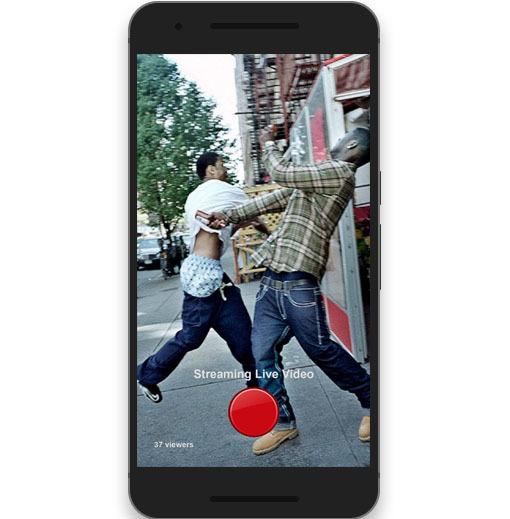 Cell 411 includes an optional “fake erase” button for situations where you are under duress or in a situation where police or other actors are forcing you to erase videoThe button will not actually erase the video but it will lead coercive individuals to believe that the video is gone and allow you to escape a potentially dangerous situation. The “fake erase” button must first be enabled in the Settings -> Options screen first before it becomes visible. Why is my live video pixelated and poor quality? The live video quality is largely dependent on the speed of your Internet connection. If you have a fast connection and a good quality smart phone, your video will look very good, however a slow internet connection or a poor cell phone signal will cause the app to buffer video a lot and encode it in lower quality, leading to a poor quality video. How do I stream video to YouTube? Go to http://youtube.com/live_dashboard and login to your YouTube account. Enable live video streaming by tapping on the “Stream now” option in the menu on the left. Once you setup your account, scroll to the bottom of the screen and retrieve your settings from the Encoder Setup window (see below); tap on Reveal to reveal your stream key. Enter the Server URL and the Stream name/key into the Cell 411 YouTube settings in the Video Settings screen. Now you are ready to stream video to your own YouTube Live channel! How do I watch my videos? Your past videos will be visible in the Settings -> Alerts tab just like any other previously issued alert. Simply tap on the video alert and you will be prompted to watch the video. How do I download a video I streamed? You can download a video by going into the Settings -> Alerts screen and then tapping on the download icon next to a video alert. The video will download to your device in the default photo or video gallery. How is Cell 411 ride sharing different? 1. Cell 411 is a decentralized ride sharing solution; in fact, it’s the only decentralized ride-sharing solution in existence. This means that we do not set prices for drivers, we do not enforce methods of payment and we do not require that drivers use a certain year vehicle or model. Our ride sharing model puts drivers and riders in charge of their own decisions. 2. Unlike other ride sharing companies, Cell 411 does not take 20-30% of the amount of fares drivers charge. There are no fees drivers pay, so drivers can keep their entire fare amount, meaning they earn 20-30% more. As a result, rides can also be cheaper for many users. 3. With Cell 411 drivers get to select their customers and vice versa. Unlike all other ride sharing platforms, with Cell 411 riders and drivers are in charge and have the power to select what driver to use for a ride. Drivers also are not forced to offer a ride to a user if they don’t want to do so. 4. Cell 411 employs a “bid-like” method when drivers receive a ride request. Multiple drivers can offer a ride to a potential customer, giving a customer the option to select a driver they wish based on price, vehicle driven, distance to pickup location, and other important factors. This gives drivers the opportunity to compete with each other and improve overall service. 5. With Cell 411, users can pay using any method they wish. 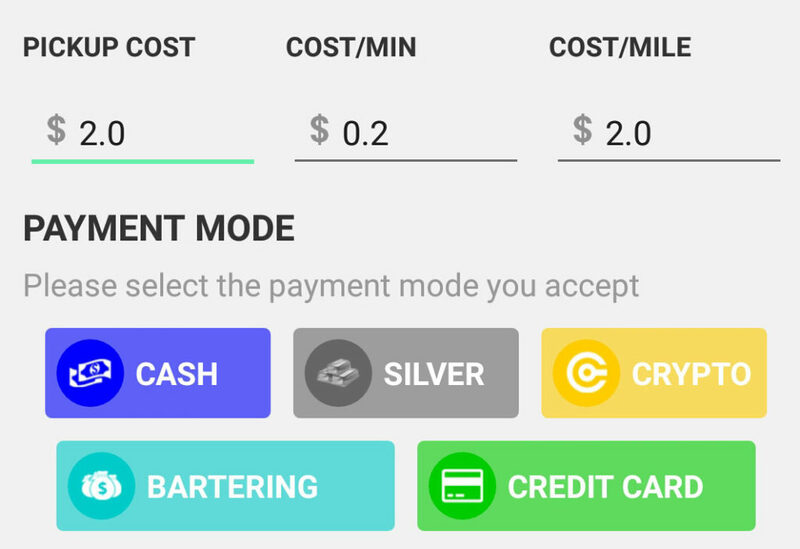 In their driving profile, drivers can enable payment methods like Credit Cards, Silver, Cash, Crypto Currency (Bitcoin, Monero, Dash, etc) or even Bartering. Based on these options, riders can choose a ride offer and make payment without a central corporate entity being involved in the transaction; we believe it is none of our business how users pay each other for services. 1. 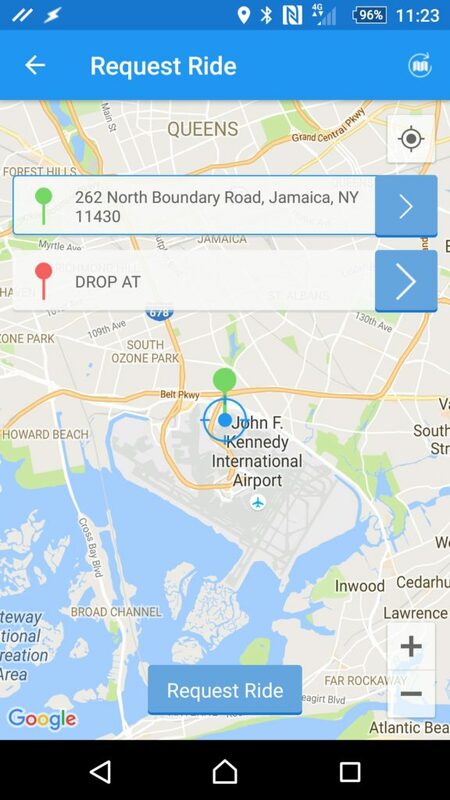 Simply open Cell 411 and tap on the green ride sharing icon in the lower left corner of the map screen. 2. You can then select your current location as the pickup location, navigate the map with your fingers, or tap the blue > arrow to perform a Google Maps search for another address. 3. 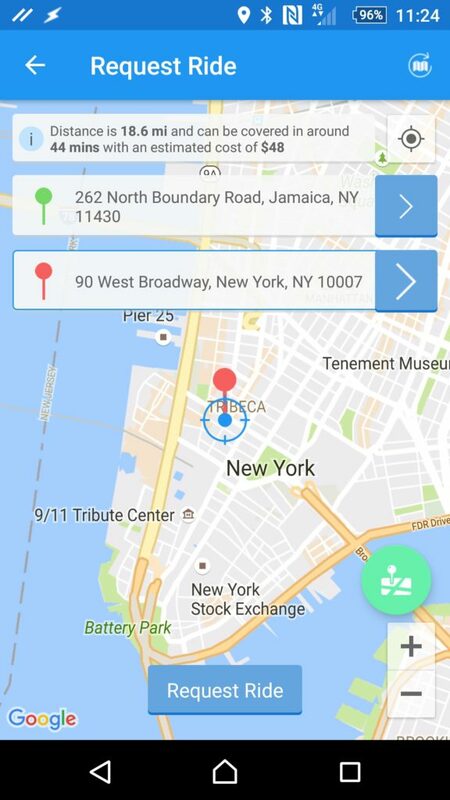 Once you selected a pickup location, tap on the red pin field to select a destination by either navigating the map or again, tapping the blue > arrow to search for an exact address. 4. Once both the pickup and destination locations are chosen, Cell 411 will give you an estimated price and send out a request to anyone in the area willing to offer rides based on the radius you selected. If a driver is available and willing to offer you a ride, you will get notified with an offer. 5. Once your ride requests go out, local drivers (if available) will respond with ride offers. You will be able to see the ride offers in your Alerts -> Ride Alerts screen. The offers will list the driver’s name, picture, vehicle picture and methods of payments. 6. Once you accept one of the ride offers made by one or more drivers in your area, you can wait for the driver to show up at the pickup location you specified. You can also tap on the driver’s name and tap the Call button if you wish to call the driver to discuss the details of the ride on the phone. Cell 411 is a decentralized platform, which means that users are responsible for payment settlements. Cell 411 does not process payments and is not involved in any way in the payment process. In your ride settings you can enable or disable credit card as a payment method (see screenshot below). You can signup for an account with Square, which offers affordable options. Go to https://squareup.com to learn more. You can use PayPal Here. Go to https://www.paypal.com/us/webapps/mpp/credit-card-reader to learn more. There are many other alternative methods as well. You can read this page for more details. When a user requests a ride, Cell 411 provides a rough estimate of what the ride might cost. This is just an estimate. The actual final price of a ride is decided by the drivers. Depending on the market they live and drive in, drivers can fine tune these numbers to better fit their needs. Before sending out the final ride offer, drivers have one last chance to update the total price calculated by the app. Remember, a rider could receive multiple ride offers from multiple drivers, meaning that drivers compete with each other for price, quality of service, vehicle type, distance to pickup and other factors which may affect a rider’s decision to choose a particular driver for a ride. We believe that our decentralized approach empowers our users and will ultimately lead to market forces improving overall service, prices and choices for all users. Why can't I get a ride? I live in city X, in country Y and I requested a ride using Cell 411, but no drivers are available or my request goes unanswered. What’s going on? Well, Cell 411 is a decentralized platform, which means that drivers are riders are fully in control of their own markets or cities. If you request a ride and nobody answers, that means there are few or no Cell 411 users in your area, or they are not willing to give you a ride. Unlike Uber or other companies, we do not “unlock” cities or block users from using our app in certain locations. Cell 411 works everywhere, without any limitations as long as there are users in that location willing to use it! Do I need to download anything else? Cell 411 is a decentralized platform which allows users to both respond to and request help, such as ride-sharing. Cell 411 users are both riders and drivers and no separate “driver app” is required. If you want to offer rides, simply download Cell 411 from the Apple or Google app stores. By default you will receive ride requests and you will be able to offer rides immediately. 1. Cell 411 does take some basic steps to maintain accountability on our network. Before offering rides to others, Cell 411 requires drivers to verify their phone number in order to create an audit trail for that user; we also require a profile picture and a vehicle picture. This gives us additional data points that will allow us to track down the user in question should any problems arise. 2. Besides offering rides, Cell 411 is also an emergency response platform; our app can allow all users to easily issue emergency alerts to everyone in your area should you need help. Drivers and riders in a specific market can organize independent groups to offer mutual aid and response in case of emergencies. 3. Take responsibility for your own safety; background checks do not work and do not stop service industry participants from assaulting their customers. For example, there are entire websites dedicated to documenting UBER incidents, such as this website. 4. 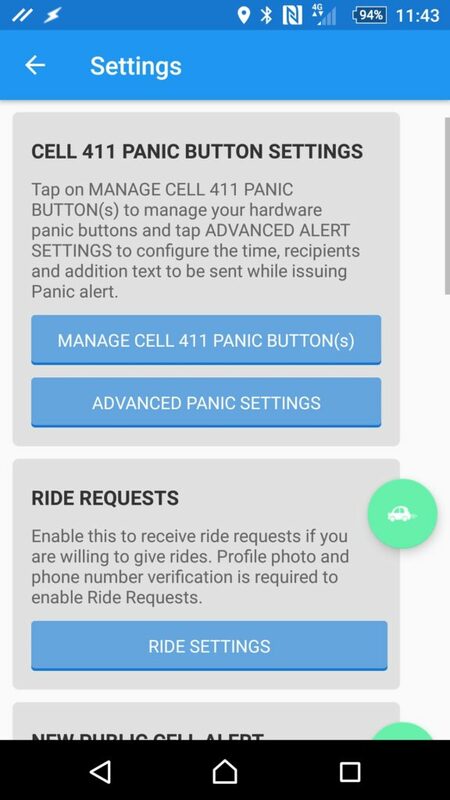 Drivers and riders can always purchase the Cell 411 Panic Button, which allows Cell 411 users to notify each other of emergencies in real time. Remember, you must take responsibility for your own safety and use common sense to determine the risk associated with certain activities: verify the profile picture of a driver, his/her vehicle and user reviews to make appropriate decisions. While safety incidents related to ride sharing are rare, no amount of background checks performed on drivers can prevent incidents from taking place. How do I offer rides? Go into your Settings and make sure that your Ride Requests are enabled. By default, all Cell 411 users will receive ride requests, but make sure the ride request icon should be green and enabled if you want to receive requests and offer rides to others. While you can receive ride requests from others, you will not be able to actually offer rides until you verify your phone number associated with your profile. This is for your own safety and the safety of other users. You can verify your number by going into Settings -> My Profile and tapping on your number. You will receive an SMS message with a code confirming your number is valid and accurate. You also need to have an accurate and valid selfie or current profile picture so riders can recognize your face; this is also for everyone’s safety. You can upload a current profile picture by going into Settings -> My Profile and tapping on the round image in your profile. You will be prompted to upload a picture or take a new picture using your smartphone camera. The last requirement is that you need a picture of the vehicle you are driving. Please go into Settings -> Ride Settings and tap on the vehicle edit image. You will be prompted to upload a picture or take a new picture using your smartphone camera. One optional step is to select the payment methods you are willing to accept. If you go to Settings -> Ride Settings, you can tap on each payment method you wish to enable or disable. Currently you can select Cash, Silver, Crypto Currency, Bartering and Credit Cards. Once you select the payment methods you are willing to accept, tap the Update button. 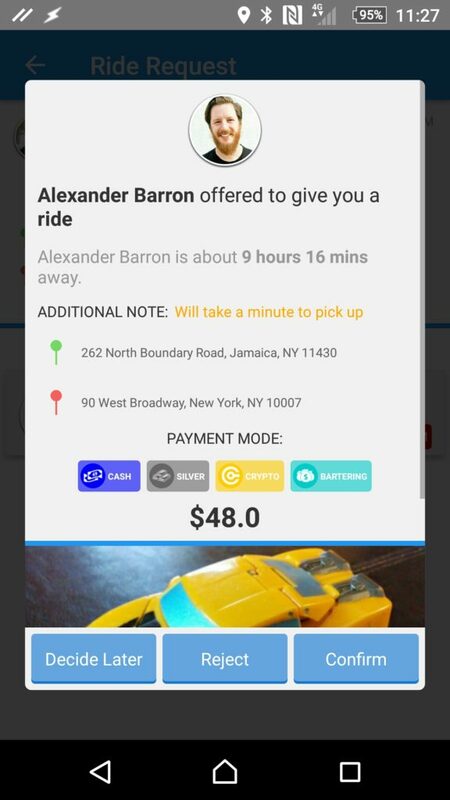 Users requesting rides will be able to view your payment methods and decide to accept you as a driver based on the payment methods you are willing to use. 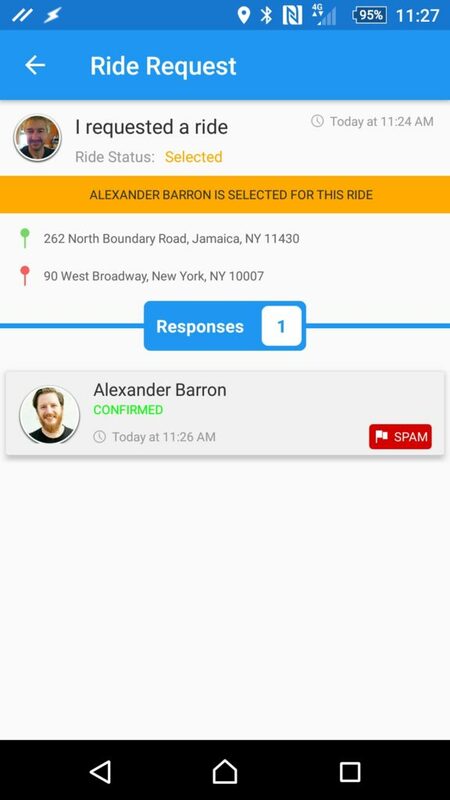 When a user in your area requests a ride, you will be receive a notification that contains the user’s name, picture, pickup location and destination location. 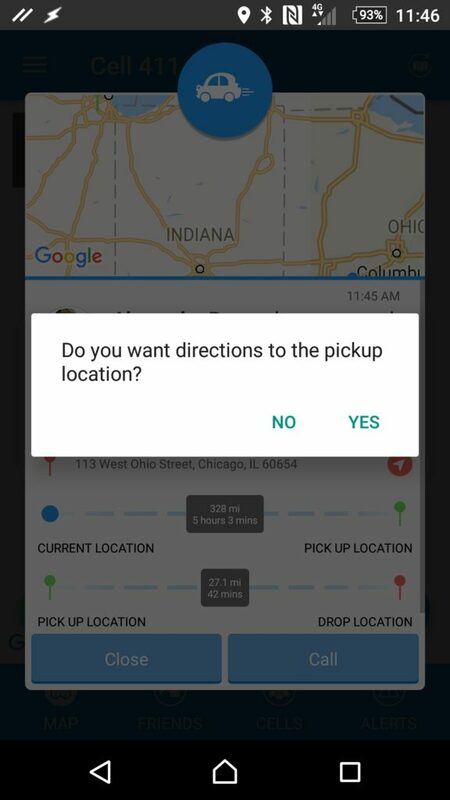 The notification also contains the distance and minutes to each location, so you can decide to offer or reject the ride request if you are too far from the pickup location, for example. You can also decide to accept or reject the ride request if the user has poor reviews. 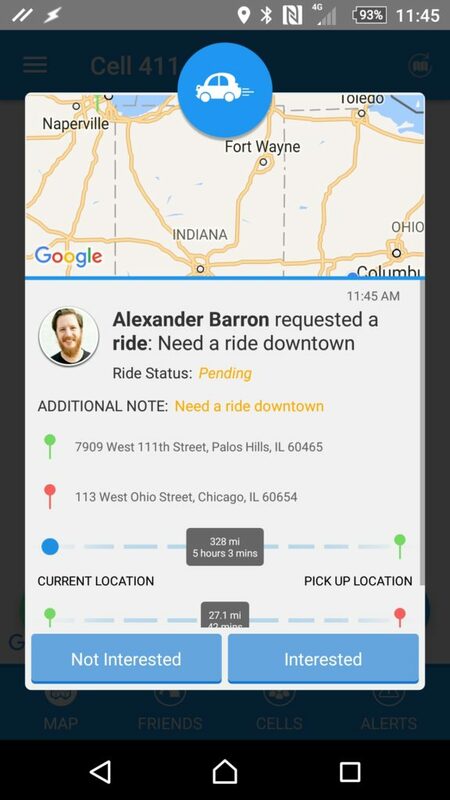 If you need to get in touch with the rider, you can tap on the “You have a pending request” message on the main map screen and then tap the Call button to call the rider and discuss on the phone the specifics of the ride, payment, etc. When the ride was accepted by the user, the status will show as Confirmed and the details to the pickup location and drop-off location will show up in the Ride details screen. After completing the ride, riders and drivers can rate each other on a 1-5 scale, offering assurance to other users about the quality of the experience and other aspects of the ride. How do I accept crypto currency? Cell 411 is a decentralized platform, which means that users are responsible for payment settlements. Cell 411 does not process payments and is not involved in any way in the payment process. 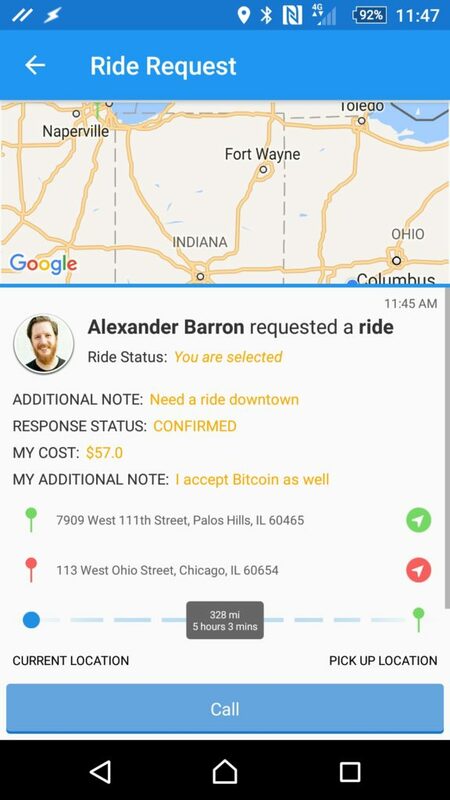 Drivers can enable Crypto Currency as a method of payment in their profile settings (see screnshot below), but you should confirm with the rider before hand the type of currency you are willing to use for the ride. Some users may wish to pay via Bitcoin while other may want to use Monero or Dash for example. In either case, we recommend that drivers and riders use an easy-to-use wallet to settle payments and Jaxx or Mycelium are the some of the easiest apps to use to make mobile crypto payments. What payment methods are used? Cell 411 is a decentralized platform, which means that users are responsible for payment settlements. Cell 411 does not process payments and is not involved in any way in the payment process. In their Cell 411 profile, users can select the following payment methods: Cash (enabled by default), Silver, Crypto Currency, Bartering and Credit Cards. These choices will be visible to users requesting rides and will give them the ability to choose drivers based on their payment methods. For example, a rider may only want to pay with cash, so they may select a driver who only accept cash, or another rider may only want to use Bitcoin to pay for a ride, thus choosing a driver willing to accept Bitcoin. The more payment methods drivers are willing to accept, the more users their services will appeal to. Does ride sharing work in my country? Cell 411 is a decentralized platform and has no geographic limitations. You can literally use Cell 411 and all its features anywhere in the world as long as you have smart phone data coverage and as long as Google and Apple maps have map data published for your area. With Cell 411 you can issue alerts, request rides and offer rides in any country and any city in the world. There is no country or city to “unlock” and no “karma points” needed to use the app. Cell 411 just works, and as long as there are other users in your area using the app, you will be able to network with them and use the features we offer everywhere. Important Note: some countries or cities may have laws in place which require special licensing or government approvals before you can offer rides; you are responsible to obtain all required documentation, licenses and insurance as you may be subject to them. Please consult your local laws and ordinances if you wish to be compliant. Is there a weapons policy? Cell 411 is a decentralized platform and has no centralized controls on what you can and cannot bring into someone’s vehicle. The issue of firearms is between the owner of the vehicle and other users. If the vehicle owner and driver has a policy, they should inform the customers right away, however drivers are not Cell 411 employees or contractors and are not subject to our requirements. We therefore encourage everyone to respect private property rights and the requests of vehicle owners. If you experience any issues with the app, found a bug, have any questions, or just want to give us some feedback, use this form to get in touch.